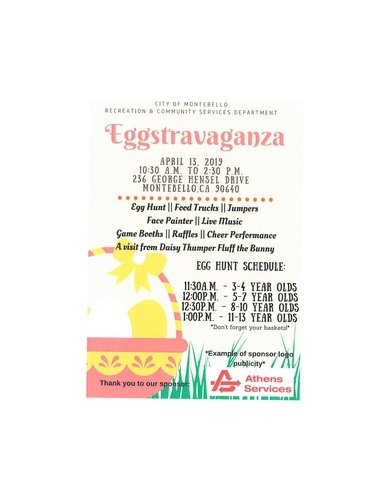 City of Montebello Recreation & Community Services Department presents EGGSTRAVAGANZA!!! Egg Hunt, Food Trucks, Jumpers, Face Painting, Live Music, Game Booths, Raffles, Cheer Performance, & a visit from Daisy Thumper Fluff the Bunny!! Egg Hunt Schedule: Do not forget your baskets!